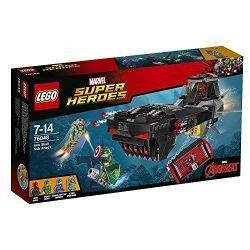 76048 Iron Skull Sub Attack is a Marvel Super Heroes set released in 2016. Dive to rescue Scuba Captain America from Iron Skull! 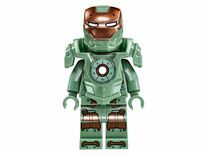 Iron Skull has trapped him in his awesome Iron Skull Sub! Go deep underwater with Scuba Iron Man to save your fellow Avenger. Fend off attacks by the Hydra diver on his underwater jet and dodge the Sub’s stud shooters. 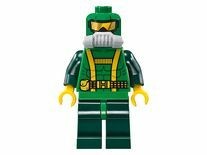 Then face off against Iron Skull and defeat him to free Scuba Captain America! 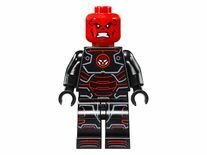 Includes 4 minifigures: Scuba Iron Man, Scuba Captain America, Iron Skull and a Hydra diver. The Iron Skull Sub features a red skull logo, opening cockpit, cage with translucent-red opening door and chain attachment to drop down and trap Scuba Captain America, 4 * stud shooters and a storage compartment for Iron Skull’s gear. The Hydra diver’s underwater jet features 2 harpoons. Find a way into the Iron Skull Sub and help Scuba Captain America escape from evil Hydra. 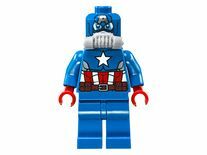 Accessory elements include Scuba Iron Man and Iron Skull’s thrusters for their hands and feet, Scuba Captain America and Hydra diver’s oxygen tank and flippers, plus Scuba Captain America’s shield. Also includes a comic book. Iron Skull Sub measures over 3” (9cm) high, 9” (23cm) long and 4” (12cm) wide. Hydra diver’s underwater jet measures over 1” (4cm) long, 1” (4cm) wide and under 1” (2cm) high. Facts about "76048 Iron Skull Sub Attack"
This page was last edited on 12 January 2016, at 21:35.